On Sunday, October 16th the Northwest Chicago Film Society will be hosting “Home Movie Day Northwest” in collaboration with the Chicago Film Archives and the Northwest Chicago Historical Society. 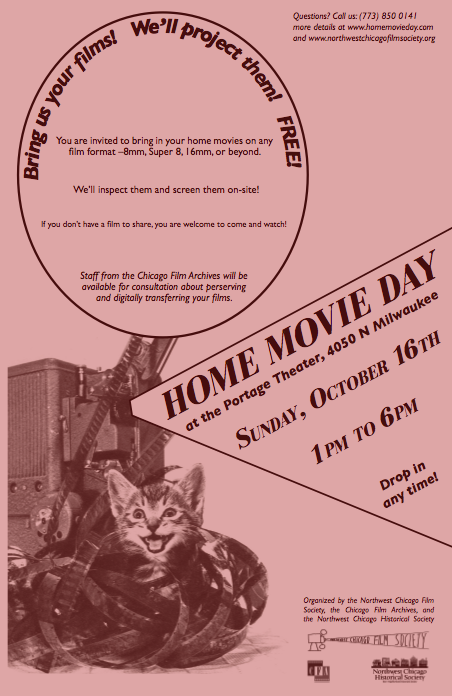 (The Chicago Film Archives will also be hosting a Home Movie Day event at the Chicago Cultural Center on Saturday, October 15th from 12-5PM). Home Movie Day is a worldwide event conceived by archivists at the Center for Home Movies in 2002 as a means to promote the preservation and appreciation of home movies and to celebrate the prolific celluloid output of amateur filmmakers in the 20th century. Members of the public are invited to bring in home movies or other celluloid artifacts on any film format – 8mm, Super 8, 16mm, or beyond – for inspection, discussion, and on-site projection. It’s always hard to predict what will end up on the screen at Home Movie Day – Grandpa Joe eating a watermelon in slo-mo, circa 1957? Mom as a tot at Kiddieland? Dubious home-brew animation experiments? But it promises to be a blast (literally) from the past!